Monsters remain a popular costume choice for people of all ages. You can go all out for Halloween by using makeup and other embellishments such as transfers and tattoos to create a unique monster look like no other. From subtle to scary, there are a variety of monster makeup options to consider that are simple and fun to create. Colorful makeup, face paints and other accents all can be used to create an original monster costume that will be a hit for Halloween or a costume party. A monster costume is sure to scare and be something unforgettable. Once you decide you want to create a monster costume, you will want to make sure you have all the basics on hand. Before applying makeup, you will want to start off with a fresh face. Make sure there are no oils or makeup on your skin since face paints, makeup and transfers will slide off your skin and not hold properly when applied over other products. White cream makeup to use as your base. This can be applied with your fingertips or a makeup sponge. Be sure to start off light and add more as needed. Grey cream makeup can be used over white to create a corpse-like tone. It can be applied with a sponge and used sparingly over the face. Grey eye shadow can be used as blush and can be applied to the cheeks to create a sunken, hollow appearance. It can also be used under the eyes to create circles. Light powder will be used after all your makeup is applied to set the products and keep them in place. Black eyeliner to make circles around your eyes and add special touches to your face. Red lip liner or fake blood to add to scars and wounds. Face paints and makeup in colors such as green, red and black to create wounds and scars. These can be applied with a makeup brush or sponge. Temporary tattoos in designs such as scars, wounds and stitches. Scars all over your face using black eyeliner or red lip liner. Scars can be zig-zag lines, X's or just random designs. Weird designs can be created on your forehead such as an extra eye or a scary mouth simply by using face paint. Wounds can be created using red and black makeup or applied as a temporary tattoo. In addition to face makeup, you will want to carry the monster look to your hands and neck as well. You can add some scars to your neck, arms and hands using the same makeup techniques you used for your face or by placing a temporary tattoo or transfer on the area of your choice. Academy award winning and Emmy nominated makeup and tattoo artist Christien Tinsley provided samples of his line of FX Transfers to show just how simple and affordable it can be enhance your monster look. Tinsley explains that creating special accents with transfers can be easier than working with traditional costume makeup to finish your look. He suggests using transfers any number of ways. He says, "Someone could use FX temporary tattoos to add to a beaten, wounded, stapled, stitched or even nerdy look with zits." All of these options are perfect effects for monster costumes. 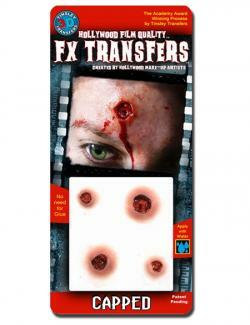 Like other temporary tattoos, FX Transfers apply with water and are easily removed. Christien Tinsley also provided insight about new monster makeup ideas, noting that the latest trend for the Halloween season is to create looks like those from Monster High, as well as traditional monster looks. 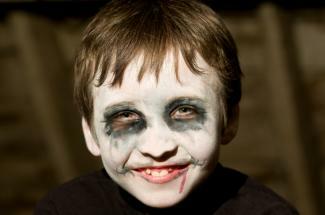 Tinsley explains, "Traditional Halloween makeup like zombies and vampires never go out of style. They just change a bit due to whatever film or TV show is popular." Unlike scary monsters, the characters of Monster High wear trendy, popular clothing but take on attributes of the monsters they are related to. Some characters have fangs, scars, etc. Since the Monster High line is so popular, there are numerous makeup kits available to help you create the looks of your favorite characters. Kits can be purchased at costume stores, Walmart and other retailers. 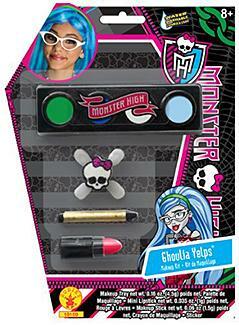 Monster High kits include a palette of makeup colors, lipstick, applicators and a temporary tattoo. Apply white cream makeup all over your face, leaving your eye and lips bare. Add white powder over the base and your entire face. Use blue eye shadow on a large brush and apply all over face. Use dark pink shadow on your eye lids and a darker pink on your brow bones. Apply black liquid eyeliner around each eye. Use dark brown shadow on your eyebrows and mascara to your lashes. Apply hot pink lipstick and gloss to your lips. Finish your look with horn-rimmed glasses and a bright blue wig. Instructions for creating looks for Monster High characters Clawdeen Wolf can be found in Werewolf Makeup and Frankie Stein in Frankenstein Makeup. You can find costume makeup during the Halloween season wherever costumes are sold. 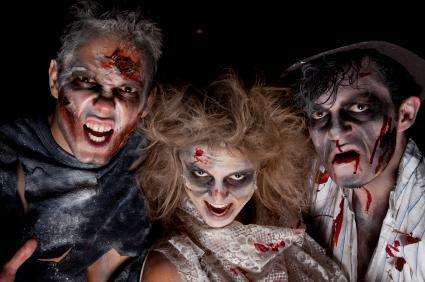 Most discount stores, local drug stores and costume shops sell kits tailored to specific costumes such as monsters. You can also shop online year-round at sites such as Buy Costumes and Spirit Halloween.